Resumen. Se busca entender cuáles son las respuestas biológicas que se dan en diferentes etapas de la implantología, centrando la atención en la influencia de la tecnología en la formación del ancho biológico. Se analiza cómo fue evolucionando la ciencia en la búsqueda de mejores respuestas y cuáles serán los factores decisivos para que la tecnología influencie a la biología y poder aproximarse cada vez más a lo natural. Abrahamsson I, Berglundh T, Glantz PO, Lindhe J. (1998) The mucosal attachment at different abutments. An experimental study in dogs. J Clin Periodontol; 25 (9): 721-7. Abrahamsson I, Berglundh T, Lindhe J. (1997) The mucosal barrier following abutment dis/reconnection. An experimental study in dogs. J Clin Periodontol. 24 (8): 568-72. Araújo MG, Lindhe J. (2005) Dimensional ridge alterations following tooth extraction. An experimental study in the dog. J Clin Periodontol. ; 32(2):212-8. Berglundh T, Lindhe J. (1996) Dimension of the periimplant mucosa. Biological width revisited. J Clin Periodontol.;23(10):971-3. Broggini N, McManus LM, Hermann JS, Medina RU, Oates TW, Schenk RK, Buser D, Mellonig JT, Cochran DL. (2003) Persistent acute inflammation at the implant-abutment interface. J Dent Res. ;82(3):232-7. Broggini N, McManus LM, Hermann JS, Medina R, Schenk RK, Buser D, Cochran DL. (2006) Periimplant inflammation defined by the implant-abutment interface. J Dent Res. ;85(5):473-8.
anatomic and surgical considerations. Int J Oral Maxillofac Implants. ;19 Suppl:43-61.
the results of a randomized-controlled trial. Clin Oral Implants Res. ;21(1):115-21. Degidi M, Iezzi G, Scarano A, Piattelli A. (2008) Immediately loaded titanium implant with a tissue-stabilizing/ maintaining design ('beyond platform switch') retrieved from man after 4 weeks: a histological and histomorphometrical evaluation. A case report. Clin Oral Implants Res. 19(3):276-82.
its effect on bone healing around subcrestal tapered implants. Clin Oral Implants Res. ;22(11):1303-7. Degidi M, Piattelli A, Scarano A, Shibli JA, Iezzi G. (2012) Peri-implant collagen fibers around human cone Morse connection implants under polarized light: a report of three cases. Int J Period Restor Dent.;32(3):323-8. reactions in peri-implant soft tissues. J Clin. Periodontol. ;22(3):255-61. Hansson S. (2003) A conical implant-abutment interface at the level of the marginal bone improves the distribution of stresses in the supporting bone. An axisymmetric finite element analysis. Clin Oral Implants Res. ; 14(3):286-93. Hermann JS, Buser D, Schenk RK, Schoolfield JD, Cochran DL. (2001) Biologic Width around one- and two-piece titanium implants. Clin Oral Implants Res. 12(6):559-71.
implants in the canine mandible. J Periodontol; 72(10): 1372-83. Lazzara RJ, Porter SS. (2006) Platform switching: a new concept in implant dentistry for controlling postrestorative crestal bone levels. Int J Period Restor Dent. ;26(1):9-17.
bone level: a 3-year prospective study. Clin Oral Implants Res.;18(4):465-70. Linkevicius T, Apse P, Grybauskas S, Puisys A. (2009) The influence of soft tissue thickness on crestal bone changes around implants: a 1-year prospective controlled clinical trial. Int J Oral Maxillofac Implants. 24(4):712-9.
thickness on crestal bone changes around implants with platform switching: a comparative clinical study. Nevins M, Kim DM, Jun SH, Guze K, Schupbach P, Nevins ML. (2010) Histologic evidence of a connective tissue attachment to laser microgrooved abutments: a canine study. Int J Period Restor Dent. ; 30(3):245-55. Ranieri R, Ferreira A, Souza E, Arcoverde J, Dametto F, Gade-Neto C, Seabra F, Sarmento C. (2015) The bacterial sealing capacity of morse taper implant-abutment systems in vitro. J Periodontol. ;86(5):696-702. Rompen E. (2012) The impact of the type and configuration of abutments and their (repeated) removal on the attachment level and marginal bone. Eur J Oral Implantol. ;5 Suppl:S83-90. Scarano A, Assenza B, Piattelli M, Iezzi G, Leghissa GC, Quaranta A, Tortora P, Piattelli A. (2005) A 16-year study of the microgap between 272 human titanium implants and their abutments. J Oral Implantol. ;31(6):269-75.
bone crest. J Periodontol. ;71(4):546-9.
and configuration on the periimplant bone morphology in submerged implants. An experimental study in dogs. Clin Oral Implants Res. ;19(11):1141-7. Zuhr O, Hürzeler M (2012). Plastic-esthetic periodontal and implant surgery: a microsurgical approach. London: Quintessence. BERCIANOS, Mauro; AGUERRONDO, Jorge. Periointegración.. Actas Odontológicas (Publicación discontinuada), [S.l. ], v. 12, n. 2, p. 4-11, mar. 2016. ISSN 2393-6304. 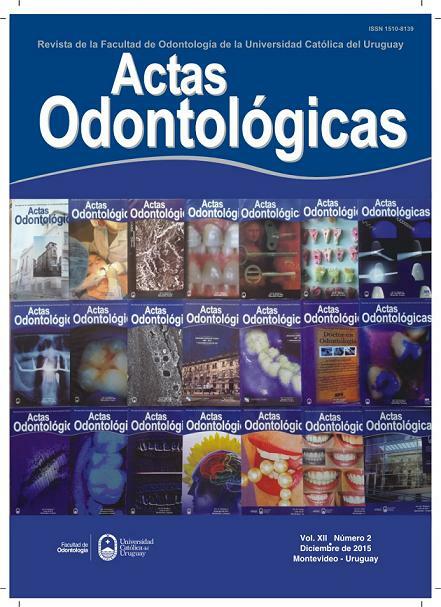 Disponible en: <http://revistas.ucu.edu.uy/index.php/actasodontologicas/article/view/923>. Fecha de acceso: 23 apr. 2019 doi: https://doi.org/10.22235/ao.v12i2.923.